Coralville, Iowa – Jay Horton of All Star Pro Golf and Clark Smith of AHEAD won the Iowa PGA Pro-Pro #1 at Brown Deer Golf Club on April 1. The Pro-Pro #1 was held in conjunction with the Iowa Spring Business Meeting. The morning got started with the Iowa Spring Business Meeting where PGA of America Secretary, John Lindert, John Sheridan with Under Armour, Kevin Dorrington with Harris Golf Cars and various members of the Iowa PGA Board spoke to the Iowa PGA Membership. It was an honor to have Lindert at our meeting and speak to our Members about the PGA of America and his journey in the golf industry. 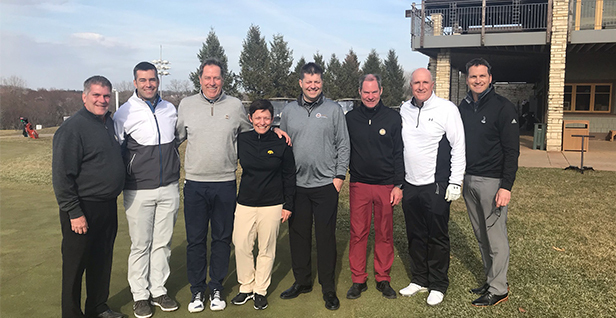 Following the Spring Meeting, Iowa PGA Professionals teed it up on Brown Deer Golf Club in an 18-hole team event, one best ball of two format. Horton and Smith claimed the victory with a 7-under-par 64. The duo carded a bogey-free round with seven birdies. Three teams finished two-strokes behind Horton and Smith. The teams of Chad Callan and Jay Giannetto, Mark Egly and Sean McCarty and Darin Fisher and Ben Splichal all finished T2 at 5-under-par 66. The teams of Greg Dingel and John Dinnebier and Todd Fowler and Curt Schnell rounded out the top-5. Both teams carded 4-under 67s in the non-point event. The Iowa PGA would like to thank Sean McCarty, Brian Wernimont and the entire Brown Deer Golf Club for hosting this event. We would also like to thank John Sheridan, Kevin Dorrington and our Presenting Sponsors Under Armour and Harris Golf Cars for their support in sponsoring this event. It was a great honor for the Iowa PGA to host John Lindert and we appreciate his presence and insights. The Iowa PGA season will continue next week with the Iowa PGA Pro-Pro #2 at Muscatine Municipal Golf Course. Registration for this event closes Tuesday, April 2. Click here to register.